This of course doesn’t invalidate the book; it just gives it a naïveté the wealth of references never quite counter. But then its naïveté is also its strength: for though Frampton finds himself quarrying around in academic rather than critical material, you feel he’s never quite at home there. He’s like a young apprentice with an idea in his heart but not quite in his head, and he wants to sound out various voices: wants to speak to the oracles and see what they have to say first. This is useful when we feel he’s writing about those who’ve been revelatory to him – most especially Deleuze, to a lesser degree Cavell and Vivian Sobchack – but less so when he becomes the eager PhD student determined to fill all potential gaps. A “manifesto for a radically new way of understanding cinema” loses a great deal of its manifest radicalism if it feels obliged to name-check every potential academic predecessor. This is really the crux of Frampton’s book. How can we do criticism that is not about the film as a made thing, but as a perceptual opportunity? For this he adopts the term “filmind”, proposing that film is sort of doing philosophy in its own way. We do not need to apply philosophical language or terms to comprehend the film; film itself is a philosophical problematic working itself out. We don’t need to think about the intentionality behind the camera, but the problematic in front of it. If we think again of À bout de souffle, a filmind approach wouldn’t be interested in how Godard did or did not deviate from various perceived norms, and how he had his cameraman in a wheelchair shooting raw footage on the streets of Paris. It would be more concerned with the viewer’s sense of the Paris streets, the viewer’s feeling that suddenly on screen we’re watching details that don’t seem narratively relevant, but vaguely, allusively pertinent. As for Godard’s use of the jump cut, again it’s not what we know that is important (“oh, look there is a jump cut”), but what the cut does to us emotionally. It is an example of the film playing with our perceptual faculties, giving us a sense of filmic immediacy that leaves us not thinking of the broken rules, but feeling the rush of risk. It is the difference between enacting a crime and sitting in a court of law judging it. Frampton’s dismissive term for those who hold to the perspective of the made object is “technicist”, and here he probably takes the argument too far. When he says, in relation to Béla Tarr’s work, “there are no longer ‘long takes’, but thinkings of the human ‘gaplessness’ of experience: we do not edit experience and the film wants to show this,” (p. 139) here Frampton removes one “technicist” term – “long take” – only for another – “edit” – to slip in through the back door of interpretation. This isn’t to show up Frampton’s contradictions; just to say that it might be a lot harder to get rid of technicist language than he would like. And maybe there is no need to get rid of it, but just to break it down in such a way that we can allow technical language not just to describe the film’s making, but also, very specifically, viewer perceptions. Thus a combination of poetical and technical language can really open up film thinking. One thinks, for example, of David Thomson’s comment that “when [Peter] Greenaway’s camera makes its rapid, sidelong tracking movements from space to space it resembles a rat in the skirting boards, thrilled by human squalor” (4). Here he captures perfectly the technical and the poetic. Here we’re in the middle of a pretty dense hermeneutic. Then there is Daney, happy to parade his assuredness, but so confident he’s quite happy to tell the viewer about the gaps in his knowledge. He opens his famous article “The Tracking Shot in Kapo” with the claim “Among the movies I have never seen there is not only October [Eisenstein, 1928], Le jour se lève [Marcel Carné, 1939] and Bambi [David Hand, 1942], there is also the obscure Kapo [Gillo Pontecorvo, 1959]…Am I the only one who has never seen this movie and yet hasn’t forgotten it?” (6) Daney goes on to say he’s seen it because Jacques Rivette’s analysis of the film showed it to him in words. Through evocation and provocation Daney himself would bring films to life, and would cheerfully offer partial knowledge because he knew film was an intensely subjective experience. There really doesn’t seem to be anything here that an empathic, frame-conscious, camera-aware critic wouldn’t propose. On the Dardenne brothers’ films, he notices that “it is the films’ forms that think a physicality that the filmgoer affectively, directly feels: the rough shift cuts, the always active movement, the grainy grey image.” (p. 145) Again, all we really need are critics who choose to concentrate on how the Dardennes, formally as well as emotionally, create space in the viewer for what amounts to a double acceptance. First, that we accept a style of cinema which not so much shows us images but that actively engages us in their creation. Thus so often in the Dardennes’ films we aren’t given the establishing shot to locate us in space, nor are we given the cut to off-screen space when a sound cue would suggest there is something going on just beyond the frame, something that we would like to know more about. It’s as if in their tight close-ups they build suspense less in the what-happens-next of the narrative, but in the what-happens-next of the shot that they hold. For example, in one scene in L’Enfant (The Child, Jean-Pierre Dardenne and Luc Dardenne, 2005), the central male character gets on the bus and the Dardennes hold on his face and body as we wait to find out if the girlfriend that he’s following has also got on the bus. We don’t so much want to know what will happen next in conventional narrative terms: all we ask is that the camera moves away from the central character, or the character move along the bus to see if the girlfriend’s on the bus also. There is suspense in that temporary withholding, but we needn’t drop technical terms altogether to try and explain how this works emotionally and psychologically – we just need the terms to take us somewhere else. Frampton’s real and very understandable gripe is that often those writing on cinema assume a straight-forward cause and effect between the technical skill and the emotional effect, and the viewer is caught in the Pavlovian result. Just because we know what the director is doing, that doesn’t mean we know what we’re feeling. Yet many critics have shown us what the film is doing and what we’re feeling. So with too many references to academic writers who hint at the possibilities of a filmind, too few references to the sort of critics who practise the very thinking Frampton predicts for the future of film, too blanket a rejection of technical terms, and a so-so hermeneutic grasp, can we say Frampton’s book is a failure? Not at all, or not really: it is an often very engaging, always passionate attempt to get to grips with film problems that aren’t going to go away. As Frampton suggests, they’re even going to increase. After all, can we really use technicist terms to describe camera movements in animated or CGI films that have become metaphorical? In a live-action film it sort of makes sense to talk of a tracking shot, because that was what was used to achieve the movement we observe. But in a CGI-driven film, where the whole visual enactment was computer-generated, it might look like a tracking shot to us as we view it, but has nothing to do with a tracking shot in actuality. Can we still use film language that has become metaphorical – where a shot is like a tracking shot? Perhaps we can, but only if we accept that technical language no longer belongs to the practitioners, and the critic merely borrows it, but that the language is affective as well as technical. Perhaps the more critics use film terms with an affective dimension, the easier it will be for both the language to evolve and for terminology to be adapted accordingly. Frampton could do worse than produce a further volume concerning criticism – either an anthology or a summarising account – where critics have pushed film language into the creative, poetic and subjective, as the Thomson quote above suggests. Maybe he can follow Deleuze, whom he so obviously and so rightly admires, and offer this volume simply as Filmosophy 1 – which suggests film thinking’s possibility – and a further volume showing signs of its actuality in critical writing over the years. Then Frampton’s book could quite fruitfully suggest tomorrow’s world utilising yesterday’s news. 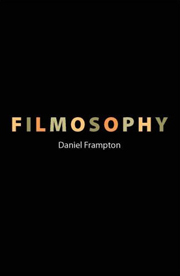 Filmosophy, by Daniel Frampton, Wallflower Press, London, 2006. Pauline Kael, “Trash, Art and the Movies”, in Going Steady, Marion Boyars, London, 1984, p. 97. David Bordwell and Kristin Thompson, Film Art: An Introduction, third edition, McGraw-Hill Publishing, New York, 1990, pp. 398-399. Jonathan Rosenbaum, Placing Movies, University of California Press, Berkeley, 1995, p. 71. David Thomson, The Biographical Dictionary of Film, André Deutsch, London, 1994, p. 303. Raymond Durgnat, Sexual Alienation in the Cinema, November Books, London, 1972, p. 280. Serge Daney, “The Tracking Shot in Kapo”, trans. Laurent Kretzschmar, Senses of Cinema, issue 30, January-March, 2004.